ecoLOGIC was inspired by the College Art Association (CAA) conference, which took place in Los Angeles in 1999, where a group of dedicated artists joined together to present a comprehensive studio session entitled Off the Mainstream, Into The Mainstream. The session included three chairs and nine artists presenting the state of environmental art in the 1990s. 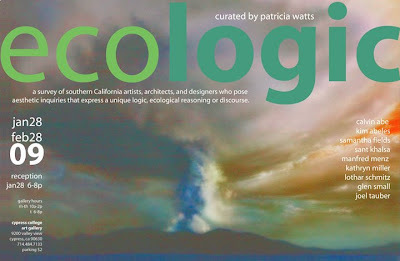 West coast curator Patricia Watts, who lived in Southern California for over twenty years and attended the CAA conference in 1999, has participated in and observed this evolution of artists addressing environmental issues in the greater Los Angeles area. EcoLOGIC was developed to coincide with the 2009 CAA conference, once again in Los Angeles, to provide a survey of Southern California artists, architects and designers who pose aesthetic inquiries that express a unique logic, ecological reasoning or discourse including Calvin Abe, Kim Abeles, Samantha Fields, Sant Khalsa, Manfred Menz, Kathryn Miller, Lothar Schmitz, Glen Small, and Joel Tauber. 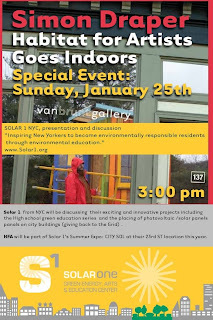 On Sunday January 23rd Solar One presented material on their projects and green education series at Van Brunt Gallery in Beacon as part of the current exhibition, Simon Draper and Habitat for Artists Goes Indoors. Amy Lipton introduced the event by explaining ecoartspace's history of collaborative relationships with environmental organizations. 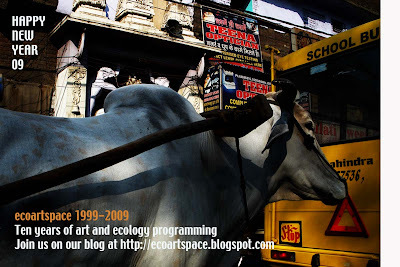 Ecoartspace has been working towards building a bridge between the art and environmental worlds for the past 10 years. Solar One co-promoted the recent Harrison's talk at Feldman Gallery in NYC (see blog posting below) and will be working with Simon Draper and Habitat for Artists during their 2009 City Sol Summer Expo. Solar One Educator Christopher Kennedy spoke about their programs with over 10,000 students at 42 schools, camps and after school programs in NYC. He passed around a book he designed, titled The Green Innovator, Design for Sustainability, a resource guide for students with strategies for thinking critically about innovative solutions to environmental challenges. The book introduces students to the concept of systems thinking: considering the relationships and connections between what we design and use everyday and the impact this has on the earth. Outreach Coordinator Christopher Neidl then gave an engaging and informative talk including a power point presentation on the history of energy use in New York leading to the development of solar panels for private, public and corporate use. His talk provided an evaluation of solar panels for environmental benefit, economic use as well as for long term sustainability. It became evident during his talk that solar photo-voltaic use, will become the number one alternative energy source for cities and home owners as we begin to move away from a fossil fuel economy. He also pointed out the connection between our transportation system and the existing energy grid as cars become electrically run and will need to "power up" via the grid - making the need for a solar based grid and industry all the more necessary in the not too distant future. Formed in 2004, Solar One is the city's first solar powered Green Energy, Arts and Education Center, their mission is to inspire New Yorkers to become environmentally responsible city dwellers. They are located in Stuyvesant Cove Park on the East River and 23rd Street situated above a former brownfield site. In 2009 they will break ground on Solar 2, an 8000 square foot 100% green powered education and arts center designed by the architecture firm Kiss & Cathcart. Stay tuned for another Solar One/ecoartspace event to take place in NYC soon. 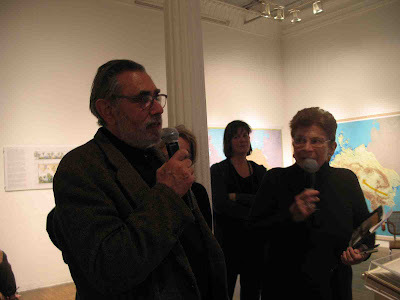 Amy Lipton hosted an Artist's Talk with Newton and Helen Mayer Harrison. The artists led a gallery tour with over 100 in attendance through their new exhibition Global Warming at the Ronald Feldman Gallery. The Harrisons have been working together as a team since the early 1970's and are two of the most influential living artists working today on ecological issues. They are considered to be pioneers in this field along with artists Robert Smithson, Han Haacke and Alan Sonfist and have been exhibiting artists at Feldman Gallery since 1974. Their practice is one of scientific inquiry, dialogic process, community engagement and collaboration. They work with biologists, ecologists, architects, urban planners and other artists to uncover ideas and solutions, which support biodiversity and community development. Working well ahead of the curve, their work must now also be considered within the context of relational aesthetics, though their revolutionary concepts proceeded the coining of this term by over two decades. The walk-through of the Global Warming exhibition focused primarily on the Harrison's new multi-media installation Greenhouse Britain, which toured the UK in 2007/8. The work consists of video, large panels comprised of text, mapping, photography and architectural models. It proposes an alternative narrative about how people might withdraw as waters rise due to sea level change, what new forms of settlement might look like, and what content or properties a new landscape might have in response to the global warming phenomenon. It also demonstrates how a city might be defended. Greenhouse Britain includes 5 components, the first being, On the Island of Britain: The Rising of Waters. This large-scale model of the Island of Britain, rests on the floor, with six overhead projectors showing animated video of the rising waters, storm surges, and the redrawn coastline. A soundtrack of three voices accompanies the piece. The next component includes 3 panels of maps and text and is titled, On the Upward Movement of People: A New Pennine Village. This work proposes a 9,000-person village where the land around it is eco-systemically redesigned to absorb the local carbon footprint of the village through the use of forest and meadow. Part 3: In Defense of the city of Bristol is a three-minute video that proposes a defense and salvation from flooding for the city of Bristol. Part 4 consists of 3 large-scale maps and text panel, The Lea Valley: On the Upward Movement of Planning (in collaboration with APG architects) which takes issue with the existing development of the Thames estuary. The model shows this area covered by water, and proposes redesigning the l,000-square mile Lea Valley watershed, while at the same time suggesting how approximately one million people might be housed in ecologically provident high-rise structures with solar power, stilts, and hanging gardens, while also enhancing the water supplies of London. The last component of the group is a large architectural model titled On Eco-civility: The Vertical Promenade (in collaboration with ATOPIA architects). Wherein the civil, social, and economic virtues embedded in a small town main street become the basis of design for a 150-story, 10,000-person, vertically-designed town, based on the concept of settlement, where eco-systemic thinking drives design as opposed to typical development models. Architects Jane Harrison and David Turnbull, from ATOPIA spoke at length about this model, their concepts and their collaborative process with the Harrisons during the creation of the work. The Harrisons then moved into the smaller gallery of the two to discuss other works, dating as early as 1974; San Diego is the Center of the World demonstrating the long history of their engagement with the topic of global warming. 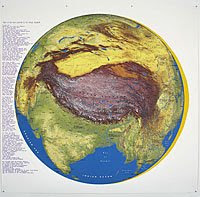 A new work from 2009, Tibet is the High Ground, Part II: The Force Majeur is a 7 x 7 ft. map of the Tibetan plateau showing the seven rivers flowing from that plateau that nourish 1.2 bilion people in ten countries who are endangered by the rapid melting of glaciers in the plateau. A brief question and answer session concluded the tour with comments by artists Aviva Rahmani, Betsy Damon, Joan Bankemper, Jackie Brookner and others. The event illuminated the Harrison's artistic process and history and exemplified the ways in which their art embraces a breathtaking range of disciplines. They are historians, diplomats, ecologists, investigators, emissaries and art activists. Their work involves proposing solutions and involves not only public discussion, but extensive mapping and documentation of these proposals in an art context. The talk was documented on video and will become available for viewing, please contact amy@ecoartspace.org for information. Greenhouse Britain (greenhousebritain.greenmuseum.org/) was produced as an artist-led project by Helen Mayer Harrison and Newton Harrison and principles of the Harrison Studio and Associates (Britain) in collaboration with Tyndall Climate Center, Great Britain, designed by Westergaard & Harrison, and funded by the Department for Environment, Food and Rural Affairs. Exhibited at the Rotunda at London City Hall, Greenhouse Britain toured across England in 2007-08).